We’ve been comparatively quiet this year at Games Precipice but we’ve been as busy as ever. We recently wrapped up our second series of topics by diving into Twilight Struggle, Bohnanza and Concordia/Lewis & Clark. In February, Matt and I contributed to Game Nite Magazine with an article about Variation in games; randomness, hidden information, replay value and the differences between internal and external variation. You can read the full article and the entirety of issue #2 here. In March, we managed to get our logo in place and in the past month we’ve launched a Patreon campaign to further our efforts this year as we’ve been structuring a host of new topics we plan to cover in the months to come. I enjoyed your Lewis & Clark commentary [design analysis of Lewis & Clark]. It isn’t the only game where a player can paddle in circles at the beginning of the game and run aground before the finish line. I thought you might enjoy this. Games Precipice: I’m only slightly upset that I didn’t make this connection while writing the article but I’m so glad I got to see this, especially considering Mario Kart is a favorite pastime and one of the best examples we used while talking about catch-up mechanics, rubber-banding and positional balance. Lewis & Clark really does give that same vibe of “getting Mario Karted” in a self-inflicted I-can’t-believe-I-hit-my-own-banana-peel kinda way. Hi! I’m a game designer from France and a regular reader of Game Precipice. I wanted to keep your theoretical articles as reference for my own use so I started to translate them, and today I’ve completed almost all of them. I think they could be appreciated by many game design enthusiasts in France that are not fluent in English. Would you allow me to publish these translations online? Games Precipice: We’ve talked about it a few times, but one of the best parts about what we do is connecting with game designers around the world. One of those people we’ve had a chance to connect with is Xavier Lardy, an amazing game designer from France who shares our ambition of providing new and interesting resources to game designers. Xavier has rather impressively translated our articles into French and generously presented the structures and frameworks we use here to an important audience we could otherwise never reach. These can be found on Xavier’s website alongside a multitude of other resources Xavier has been collecting for years. We’re incredibly thankful for Xavier’s complete efforts and we think the larger game design community is equally as appreciative. I need a new theme for the traitor game I’m working on. Games Precipice: I don’t know if this is actually a question or just a statement, but I’ll take a stab at it. Traitor games seem to be all the rage right now and I tend to draw inspiration from historical themes, so I’ll shoot three ideas at you. Salem Witch Trials: Traitor games tend to come in two varieties: (1) a traitor definitely exists at the outset or (2) the mere possibility of a traitor creates a rift between cooperative players. I’m envisioning this one as more of the latter. The Concept: A werewolf style elimination game with the tragic reality that there may not actually be a witch. Traitor games tend to be less about “What can we do to win the game?” and more of an actual witch-hunt anyway so I’m surprised this hasn’t been done before. McCarthyism: There’s nothing quite like seeing players throw accusations around without any evidence at all. The Red Scare is the perfect platform to encourage such ludicrous behavior. The Concept: Players engage in several rounds of poker-like betting, with constantly increasing stakes and wild accusations. It is mostly bluffing, but players do have the ability to form a poker hand (evidence) that can eliminate another brave opponent who is unwilling to fold on their wild claims. When players are eliminated they must sit in silence for the remainder of the game after which they must leave the country immediately. Judas, Brutus & You: Real theme is about driving a narrative and if we’re going to be traitorous let’s put some friendships on the line. The Concept: I’m imagining a cooperative game where players are offered greater and greater incentives to stab the group leader in the back. Give it the whole “legacy” treatment; players can tear up hidden offer cards to prove their loyalty to their fellowship. In fact – tear up as many cards as you want to because after the shocking final betrayal I figure no one will ever want to play this game again anyway. 2005 gave us BGG #1 Twilight Struggle and worker placement development with Caylus. 2009 gave us Dominion and deck building. 2011 is full of great games. Games Precipice: This is exactly why we need a playoff system to determine the best year in game design. Using AP polls is ineffective because they never arrive at their rankings fast enough and the BCS (Boardgame Committee Standings) just leads to weekly arguments over computer-generated rankings. We want to avoid potential backlash toward SEC fans (Sycophantic Enthusiast Cult-of-the-New fans) that their teams (2010 and onward) could be over-represented in the bracket. To help reduce this concern I have arbitrarily grouped candidates into four divisions based on time-frame in the current golden age of board games, starting in our earliest year of 1995 up to our most recent eligible year of 2013. I seeded each of those divisions 1-4 based on initial impressions, minor feedback and shady back room deals. 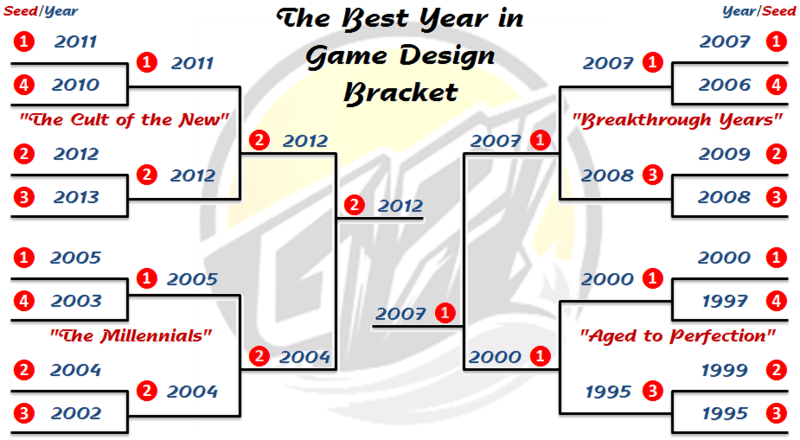 I present the 16 year bracket for the greatest year in tabletop game design. Let’s get started. This is a playoff for the best year in board game design, not just games in general. The differences are few but important and the overall idea is to prioritize years that generated large steps forward in quality and innovation and made a lasting mark. All games were assigned to years they were originally published in their original edition with conflicting dates resolved by the use of BGG. Age: The simple matter that we’re playing a game 20+ years after it was published is a fairly meaningful indicator of design value. A game design now old enough to drink alongside its audience has effectively stood a test of time and is more influential right now than a great game published just last year. 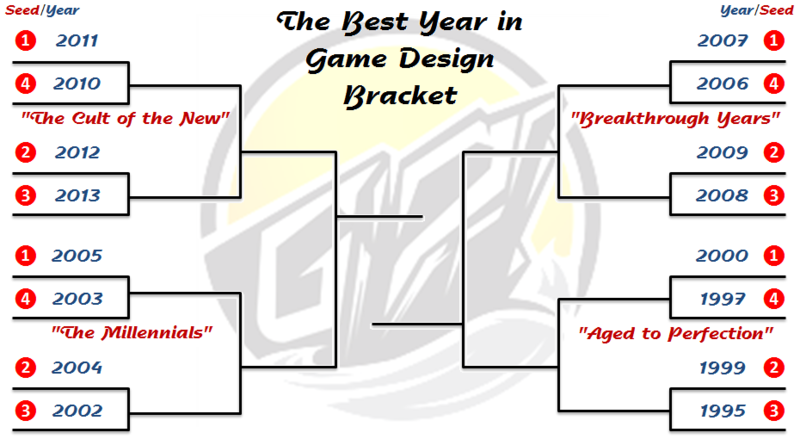 Breakthrough Ideas: Trendsetters like Dominion, Caylus or Puerto Rico spurred creative growth in game design and in this playoff have the potential to turn an otherwise ordinary year into a final four Cinderella-team if given the right matchups. Strong Variety: I looked closely at both the volume of solid games and the quality of the best games in each year. One thing that did present a small but interesting differentiating factor was the presence of a variety of genres, mechanics and ideas within the same year. Expansions, light re-implementations, second editions and big box collections/master sets: These items can provide tremendous value to gamers as we often see improvements in monetary value, replay value and rules, but they typically don’t have nearly the impact as new game designs. BGG Rankings: It would be difficult to do this without the enormous utility of BGG’s data, but there were plenty of games with influential ideas that have been buried over time. I sought out and gave extra credit to years with these games, typically from the eighties, nineties and early 2000’s. 1998 and 1992 were two years anchored by Reiner Knizia’s flurry of games throughout the 90’s. As interesting as it would have been, I didn’t find a year where a single designer could have single-handedly dragged a year into this playoff. Probably the best candidate I found (and not displayed here) was Sid Sackson in 1974 with a strong 1-2 pairing in Sleuth and Executive Decision. Sid Sackson was so far ahead of his time and the world is still learning from his work in game design. 1993 and 1983 each offer recently reprinted games (an enduring sign of quality in the modern market) but the biggest reason they found themselves left out on the bubble is that Warhammer (1983) and Warhammer 40K/MTG (1993) can attribute so much of their design success to decades of ongoing support, updates and releases. Magic: The Gathering was revolutionary but it really wouldn’t fit on a fair playing field if we’re evaluating isolated years in game design. I don’t believe a single game should be able to carry a single year, but if one could it would be Karl-Heinz Schmiel’s granddaddy of German games: Die Macher. It’s even got a great supporting cast with still-influential designs in Britannia and Kremlin. Looking back at the mid to late 90’s, it really is an incredible period of growth and a flurry of new ideas. I think these years are subject to a lot of forgotten pioneers, but can always be remembered as the foundation that would support the next two decades of great games. 1995 was a gateway year and Catan and El Grande have probably combined to indirectly inspire more gamers (and future game designers) than any other individual year. The 90’s encompassed Reiner Knizia’s most impressive run of game designs, highlighted by 1997‘s Tigris and Euphrates which I think is easily the glowing star atop a Knizia tree full of ornaments of brilliant game design. While this is the first division foursome we’ve looked at, I think this group is the closest in quality from top-to-bottom. 1999 really progressed action point systems and I think 2000 was really an first glimpse at the dawn of a new era in volume of truly great quality. 2002 gave us the legendary Puerto Rico and a Martin Wallace’s Age of Steam, but it truly doesn’t have the strong roster needed to go deep in this event and it already in a pretty tough group. 2003 would be the last team in were we to give out at-large invitations at the end of some sort of regular season. It has the recognition of Alhambra, Amun-Re, the critically underrated pairing of Mare Nostrum and Attika and was the origin of Michael Schacht’s Coloretto. It’s greatest weakness is its lack of a landmark game; it is a roster of strong role players. 2004 and 2005 create the first really compelling match-up that could really decide a lot about how the bracket plays out. I’m tempted to go with 2005‘s strong pairing of Twilight Struggle and Caylus alongside a group of clutch role-players like the brilliant Glory to Rome or a hidden economic gem like Indonesia. I’m going to side with 2004 as I think it is really the first “Wow!” year I can remember: the elegance of TTR, Memoir ’44, San Juan and Ingenious combined with the first editions of War of the Ring, Struggle of the Empires and fan favorite Betrayal at the House on the Hill. Oh yeah, and superstar quarterback Power Grid. 2006 was one of the first years I actually followed the newest releases and while it has some all-stars, it drops off relatively quickly compared to its calendar-year neighbors. The nostalgia is strong, but that won’t be nearly enough in this group. 2007 is a clear heavy weight in this group as Agricola, Race for the Galaxy and Pandemic live on as strong sources for spin-off games and expansions. An absolutely loaded roster of all-stars and one of the best years in this whole bracket. 2008 is a total dark horse year. It isn’t as deep as any of the other three years but the Dominion–BSG–Space Alert trio is among the very best in terms of innovative approaches in game design. 2009 is a perfect example of a high-quality year that just happened to be a concentration of expansions, new editions and re-implementations. I find the improvements found in Dominion: Intrigue, Steam, Imperial 2030, Small World added tremendous value to consumers but much of their success existed in their prior versions. 2010 and 2013 were incredible years (2013 being a personal favorite) but in terms of top-end quality and sheer quantity of valued designs they simply can’t match the absolutely stacked years of 2011 or 2012. 2011 comes up often in these “Best Year in Board Games” discussions and its easy to see why; it was a big year for fans of Vlaada Chvátil and Stefan Feld. At this very moment it has three titles in the BGG top 10. I’m giving the slight edge to 2012 due to the tremendous depth and variety. Even the games not pictured here make for an impressive group. Ultimately the final four plays into a competitive 2012/2004 semifinals where 2012 pulls out a close victory while 2007 stomps 2000 and goes on to win a very tight match-up over runner-up 2012 in the finals. In case you want to fill out your own bracket, find an empty one here. 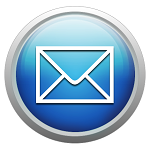 If you do fill one out, be sure to send us a picture. We’ll see you in August when we pick back up with “Early Game Structures”. I was going to ask how you accounted for games that had a small print run in the first year of publication, say only a few hundred copies, but had a greater impact in later years. Games like Hanabi and Dixit came out years before actually winning the SdJ. After re-reading, I see this is probably what you meant when you wrote that you deferred to BoardGameGeek’s year of publication. Realistically these special cases are relatively inconsequential so doing anything else would have been relatively laborious for little change. Much appreciated – it was a nice trip down memory lane. Good choice. 2007 was a big year. I think I’d go with 2012 but there were many good choices. Always entertaining.